From offshore structures to pipelines and refineries, corrosion plagues the oil and gas industry causing the loss of billions of dollars a year in maintenance costs. 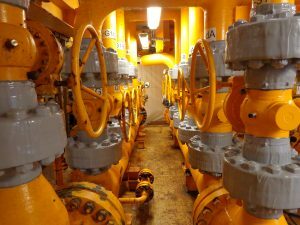 More importantly, the threatened integrity caused by corrosion opens the door to safety critical issues such as the leakage of toxic gases and chemicals creating a significant liability for a company, not to mention the environmental risks. Oxifree’s TM198 encapsulation process, using a patented thermoplastic coating with inhibiting oils, has proven successful in the prevention and protection of both new and old surfaces. Because our product is reusable during application, waste is virtually eliminated. Simply collect the excess material, remelt and reuse. TM198 provides asset life extension and reduces the need for maintenance. All of these form part of “Safety Critical Elements” which can compromise safety and production. Operators of Offshore Oil & Gas installations know the history failure by their rigorous inspection and corrosion management programs. Performance standards for corrosion control need to be supported by sound engineering justification and Oxifree was developed with these criteria in mind. Oxifree was evaluated and tested by Petrobras Research in Brazil to an astonishing 11,688 hrs of hot salt spray testing (industry approved test model) which is nearly 4 times that of conventional corrosion control products. That is why Oxifree Global can justifiably make claims that the longevity and cost effectiveness are unbeatable.